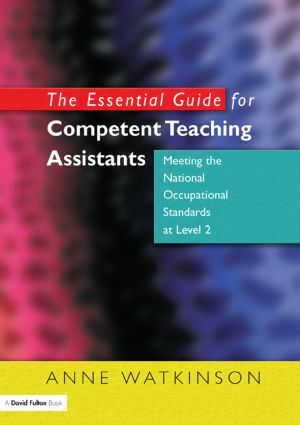 This book provides the underpinning knowledge to support teaching assistants (TAs) in all phases of schooling when undertaking study at a basic level. It contains practical examples of work, and ideas to try out. By actively learning about the work they do, TAs can gain greater confidence and understanding about the tasks they are asked to undertake. This guide will help TAs understand how pupils learn and shows how they can develop skills to support the teacher and various aspects of the curriculum. This book looks at the role of the TA within a whole school context, enabling TAs to understand their role in supporting the school, and taking appropriate responsibility for aspects of care, health, safety and wellbeing of pupils with whom they work, and play their full part in the school team. It can be used to support NVQs or other TA awards at level 2 and is related to the competencies described in NOS at level 2.